Do we all need health care? You bet we do. But even before the big March 21, 2010 Pelosi / Reid / Obama takeover, the citizens of the US already had health care. In fact, our illegal alien friends also have health care. It's been the federal law since 1986. Can you think of the expense that would be saved if the freeloaders and deadbeats from other countries were not chewing so much out of our system. Maybe we could actually afford more than just emergency room care for American citizens. By the way, I am for care for the helpless but that is where it ends. I am not for Government being the only health broker in the country because that is where individual freedom ends. Government should never make somebody helpless. In mid March 2010 before the March 21 bill passed the house, I had been reading about the supposed myths of Obamacare. In a New York Times article by Paul Krugman, he cites what he thinks are the three myths of Obamacare. From reading Paul Krugman one could get the idea that he does not read newspapers because he is too busy writing his opinion. He happens to like anything the President, the Pelosi and the Reid have to say. That is no myth for sure. His writings are pure Obama propaganda. Do you want to know a real myth? You won't get this from the New York Times. It is a myth. It is a myth that 30,000,000 people do not have healthcare. Do you know any of the 30,000,000? None of my family, and we are a heartland PA family without many white collar workers, know any. I do have relatives who have no health insurance policies but they and everybody else has healthcare. They know they have healthcare. They had it before Obamacare passed. It is the law of the land. Everybody gets healthcare either through their own money, their own insurance, Medicare, Medicaid, or EMTALA. Again, the court of last resort is EMTALA and it is the law of the land. It stands for Emergency Medical Treatment and Active Labor Act. Nobody is left out. Nobody! And, yes, the term active labor means that if you are in labor, you get to have your baby in the hospital. And, all of this without an ounce of Obamacare. Why was nobody telling this to the people? I do not mean to suggest that the ER doctors all appreciate the freeloaders who come in for running noses or drug addiction. Often, their interests are as simple as getting a sandwich and a drink and they require no treatment. I don't know why they prefer the ER to a sandwich shop. Of course, food is free in the non-ER, ER. There are food kitchens that can help them better. Hospital administrators, whose hospitals have figured out how to cope with the law of the land from 1986 have adapted or they would be out of business. I know it is hard to believe that something productive may have actually been accomplished in the pre-Obama days. But, it is true. In larger hospitals, there are often two ERs. One is for triage etc. and the other is used as a "free clinic." and a place to rest for the indigent who know the address of the ER by heart. Though free, everybody gets a bill. They just do not pay it and the don;t get the bill until they are being discharged. Having the non-ER, ER keeps costs down substantially. It is actually geared for the type of person that frequently comes in for help. I mean they are really not emergencies. They sometimes come in for healthcare, not just a drink, and they get it. If the hospital so much as discusses payment with them, before they receive treatment, they can report the hospital to HEW, and the Hospital can be sued. It is against the law to harass a patient for money in the ER before the person is treated. When they receive the treatment, they may be admitted or discharged. They cannot be let go if they need to stay. If it is a pregnancy and the mother is in labor, they get a room and they have a delivery like anybody else in the OR. (Active Labor Act). In addition to treatment, they are most often given a drink and something to eat. If they have a baby, they get the same amenities as you do, though perhaps the room is not as private. Perhaps. For the patient it is not such a bad deal. For the hospital, when the patient is finished, they typically just leave and the hospital does not get to collect anything for their service. So it is not such a good idea for the hospitals. Some patients are pure charity and some are funded one way or another by taxpayers. Hospitals have figured out how to give those in need of healthcare the care they need, other than preventive care, without it costing a $trillion dollars. So, if everybody is already covered, why do we need to cover 30,000,000 more. For me, it does not compute! There is only one answer to that question. The goal of Obamacare is not about healthcare. It is about government control of your life. A secret side of Obamacare is to make all people equal in terms of healthcare. In other words, it is not good enough for somebody to be able to be made well by the system -- via charity or by merely slipping out before they get the billing information. The goal of Obamacare is that everybody, regardless of their status in life or country of origin should have your insurance policy and your seat in your doctor's office, even if they have done nothing to earn the right. That is how I see it. Let's say that from working hard, you have a good insurance policy. Obama wants that policy in his stash so he can give it away to somebody else. No, he does not care if you worked for it. Pelosi, and Reid and Casey have been convinced by Obama that he is right on this. Hey, don't you have a heart? Why should you have an insurance policy just because you can afford it or you have a good job? Obamacare will fix that problem and take your policy and give it to somebody who he thinks is helpless. I love the EMTALA as it is a very charitable act for our nation and for many doctors who donate their services to the ER or the non-ER. It is the catch-all. Let me ask again. If everybody at a minimum has some healthcare, what is the issue? Sometimes I really do think the issue for the hard left is that those who get care in ER clinics simply do not have your insurance policy and Obama wants them to have it, not you. They may not have your employer-provided policy because maybe they do not work, but they all do have healthcare, legal and illegal among them via EMTALA. Why not just make EMTALA better? It really bugs the health redistribution crowd of hard lefties that you have your own insurance policy and they cannot get you to give it to one of the "helpless" in need of a handout. If you give up your insurance policy to somebody else, nobody from the Obamacare institute will ever have to bug you again. And, if later on, you get sick and you bug them, well, hey, you should have gotten sick when you had an insurance policy. Sorry Charley. When you think about EMTALA, I think it is pretty generous of the medical community to provide that service and yes, it takes a toll from them. EMTALA needs to be improved one way or another without everybody in America having to give up their insurance. If we can send a man to the moon, we can solve this as a country without putting the most incompetent among us, the government, in charge of healthcare. Speaking of generosity, after Obamacare passed in March, a proponent of the bill noted that there more than likely would not be an overfilling of doctor's offices with new patients because as he said, "Doctors typically see between eight and ten charity patients a week." Thank your doctor next time you see her or him. My hat is off to the doctors in the US medical community who have been so kind to us all for so long. I think the government should treat them far better. What a shame that doctors will have to depend on the Federal Government soon as their major employer, making rules that are not favorable to doctors and not favorable to patients. By the way, with EMTALA, charitable clinics, and charity care by doctors is already the practice of the land. So, where was the emergency that Pelosi and Reid were solving? There was none and there is none. If doctors see so many charitable patients a week, can it be that the goal to have the people via the government pay -- rather than permit the doctor to provide charity? It doesn't make sense like so many other government plans and programs. So, if there was no real emergency, why the big push? Again, it has nothing to do with health care. It is about government control. In a redistributive type of state, what you have if it is good is to be given to someone else who the state designates as helpless. Why should you have something that another person, who is not leading your life, does not have? That ladies and gentlemen is the essence of Obamacare -- redistribution of healthcare. Soon, you will see it playing at a medical facility near you. Hopefully, there will be lots of chairs in the waiting room. The United States has no reason to play by Lewis and Clark rules regarding Obamacare. There is no need to send out scouts and settlers into unexplored lands to find out how Obamacare would work out. Obamacare is already practiced throughout the world. They just don't use Obama's name to describe it. Until March 21, it was not how healthcare was practiced in the USA since we had higher standards. When the full weight of Obamacare comes in several years, we will long for these days as care will be hard to find. That's why those who can afford real healthcare come to the US for the best care anywhere in the world. Don't let anybody tell you differently. If you don't believe me, try another country. But, then again, you only have one life so you better guess well. That is why 76% of the population is against Obamacare. Each of us have only one life and we like it the way it is, --- living. Obamacare everywhere else is called Universal Healthcare. As good as it sounds, it never quite works out the way people hope. It is much less in reality than it is in theory. The Europeans and the Canadians and the Russians had great notions of equality before implementing their programs. Like many things that are kept equal, when everything is equal, there is no room for excellence. Based on the success in these other countries, nobody should want Obamacare. The government loves it because they are in control but the people hate it because if they do not have a ton of money and they get sick, the government figures it is OK for you to die. Look at Europe before you, as a potential healthcare patient, vote for EURO-style healthcare for Americans by keeping Obama in office. Don't worry, Congress has already voted your opinion out of the matter. But, the house voted in the 112th Congress to repeal it and the courts so far say it is unconstitutional. With Euro-style healthcare, you do not count in determining what is right for your body, and we are not talking about a fetus here. This is not an Abortion speech. It is about your body and whether the government or yourself should decide whether you are entitled to get well when you get sick. Just as the government is willing to throw away these things called "fetuses" that are the youngest of human lives, they are just as happy to throw away "oldasses" (that's the over 62 crowd), before you start costing them big time. The truthful reports on the issue indicate for sure that citizens in countries with nationalized healthcare never would have accepted this system had they known up-front about the rationing of care, the long lines, and often the lack of excellence. Oh, and did I say, the unnecessary deaths. Why is it that our leaders do not see the obvious? I sure hope they do not see it or it would mean they really want us to live shorter lives! Why have they tried to coax all of us into giving up the best insurance and care we will ever have so they can have a legacy and because some deadbeat can have equal care to those who worked all their lives. Damn their legacy! And, let the deadbeat get a job. We should all help the helpless as a charitable work, not a compulsory act, but we should never make anybody helpless. The government wants control and that control means they want to give your healthcare that you worked all you life to maintain and preserve -- they want the power to give that care, your care, to somebody else who you do not even know. They are not as concerned about what care you get in return for giving yours to the healthcare pool. Are you concerned? Do you trust yourself or the government with your healthcare? By the way, it is OK to not feel guilty about not wanting to give up your healthcare so somebody else can take it. Please, live it up, keep your house also. As bureaucrats take over medicine, you know intrinsically that costs will go up and quality will go down because doctors spend more and more of their time on government paperwork and less time helping patients. When the post office succumbs to UPS and FEDEX, will Congress come up with a means to keep the lines at the hospitals shorter. Perhaps there can be an ER stamp with a notable person on the stamp. This would permit the bearer of the stamp to have ER care. Maybe there can be a doctor stamp and a nurse stamp and a drug stamp. You know though that if the government is in charge, when you run out of stamps, you are out of Obamacare. As stamp costs skyrocket, the government could hire other inefficient bureaucrats to take the reins. If necessary, and only if necessary, government may choose to confiscate cash or print more money or maybe just print stamps to somehow pay the Obamacare bills. Can you even trust that government will pay the bills? Perhaps Congress will choose as in social security to shift any resources that they gain for Obamacare and use that money for some nice pork projects to help get the Congress reelected? Hey they do run the country! Don;t you think they think their reelections are more important than whether you live or die? The weekend in which Obamacare passed, Obama himself proclaimed that this would reduce the deficit, solve long term issues, give everybody a car, and put a chicken in every pot, or so it seemed. If you had a problem, if you listened to the man who best knows how to take credit for everything, Obamacare passing was the solution. Some said it was like Christmas in March it was so good. But do not be fooled. Obama will not be buying the presents. On Monday morning, however, when the exhilaration had ended over the huge progressive "victory," and Obama was not on the airways thirty times that day. other people got to say something about how truthful the President and Ms. Pelosi and Mr. Reid had been with the American people. It turns out, Obamacare would not cure toothaches so the Tooth Fairy indeed would still be employed. Caterpillar, once cited incorrectly by the Obama machine as having created or saved a gazillion jobs more than the US population, rained on the President and Pelosi parage. Caterpillar Inc. in the last week of March 2010 announced that the Obamacare that had just been passed by the U.S. House of Representatives would increase the company's health-care costs by more than $100 million in the first year alone. Yes, Virginia, there is a US government filled with liars. Later in the week, Caterpillar teamed up with John Deere to say that together it would cast them $250 million. Nobody from the Obama team showed up to take pictures. It was almost as if they were from Israel. The huge cost of healthcare is a major issue keeping all from having the best. If there were no cost and the care were unlimited, why would we not all opt for the best. The irony is that affordable and high quality health care for all with thousands of new features is possible only if government can be stopped from interfering with the marketplace. Even on a good day however, somebody's healthcare package is going to be better than yours and mine. And, I think that is OK. In a world of all beautiful blondes, a brunette would stand out. But those on the far left want equality. They want all grey haired pimply faces. They are so tuned into equality that they almost lost union support when they decided to one-size-fits-all the unions on health insurance by whacking their policies with a huge luxury tax. Yes, they will bite the hand that feeds them. They are obsessively and compulsively trying to work some equality magic on insurance policies but they backed off the unions' or they would not have gotten the bill passed. Their goals of equal, lowest common denominator health care remain. If your care is better than the lowest common denominator, count on it going downhill quickly with Obamacare. Who wants one of those policies? That may sound cute but the fact is the policies are so bad that the people who wrote Obamacare determined their government employee classifications and those who helped them and in the language of the bill, they excluded themselves and the rest of their cronies from participation. No, I am not kidding. The Republicans via amendments tried to get them back in but the Senate defended them and the President and so, they now operate on the only different healthcare plan in the federal government. If Obamacare is so good, who don't the people that wrote the bill want it? It's because it is a piece of crap. That's why! If the government is so concerned about the cost of healthcare, don't you wonder why Congress is not energetically advocating tort reform (malpractice suit reform?). You and I know that the cost of health care is directly affected by all the frivolous lawsuits that lawyers just love to file. It is also affected by the monstrous awards received. Granted some incidents are tragic but there are others in which the patient somehow thinks they have drawn the winning lottery ticket and nothing but a big payoff will suit their needs. This bill is not about healthcare or its high costs. It is about government control. Doctors are cutting out of their practices at an early age often because of the cost of malpractice insurance. This puts pressure on the whole system as good doctors choose not to practice. Obamacare will not make it any better. Independent doctors have no real reason to work for the government health insurance company. You know that many doctors do not take Medicaid patients today because they can;t pay their office expenses with the reimbursements from the government. Some won't even take Medicare. Who are we kidding thinking that things will get better, not worse for doctors. They will either go out of business or go back to CASH only, now that this insane health care plan has passed. Tort reform can help keep doctors in the business of healthcare as it lowers their cost to provide care. But, that is not the goal. Government control is the Obama administration's goal and the trial lawyers support the progressive agenda. Thus, limiting the trial lawyers' opportunity to realize their greed is off the table. Ask John Edwards. That's how he made his millions. Without even touching on the notion of malpractice insurance costs, “defensive medicine,” admittedly is practiced by doctors regularly so they do not get sued. This has a huge cost, estimated to consume 4 percent to 9 percent of the nation’s total health care spending. If you are scoring at home folks, that translates to between roughly $92 billion and $207 billion annually that is wasted on unnecessary tests and procedures that doctors perform simply to avoid the threat of a lawsuit. Eliminating just half of this waste would be enough to cover all uninsured Americans with about an $8,000 per year insurance policy. I am not kidding! So, do you ever ask yourself why is the healthcare bill priced at $1 trillion. Who's getting that money -- or is it just to pay for the bloated healthcare bureaucracy? (ROLL CALL March 2, 2010 -- Ann Kim, David Kendall). Malpractice insurance costs for physicians run anywhere from $15,000 per year to $100,000 with the average being about $40,000. Physicians are only one part of the malpractice formula as all healthcare providers / practitioners need liability insurance. There are between 500,000 and 600,000 physicians of all types in the U.S. today and so the amount taken from the healthcare industry for malpractice insurance in the US is huge. In other words, the cost of just the physician insurance is between $20 billion and $25 billion per year. Considering that physician cost is only one component, let's assume all other costs are equal to the physician cost of malpractice insurance. The total becomes $40 billion to $50 billion. I am not proposing that such insurance be eliminated but it can sure be reduced with Tort Reform. If half of the savings were secured, that would pay for about 40% of the uninsured. Together both components of healthcare add up to more than 140% of the cost to insure all of the uninsured citizens. You can see how important tort reform is in the total healthcare cost equation. Yet, the Congress chose not to include it in its plans. Why is that? Can it be campaign contributions from trial lawyers? If Congress is not reelected, they cannot be in control. You know what you must do with Congress, including Robert P. Casey, Jr.
Can one say that the more money and power that government has, the more power it will abuse? Will anybody, out of the chute, just agree to that or does that have to be proven? Hey, there are frightening aspects of all this. Is it possible that by cutting costs, which government will inevitably do when tied against the wall, that this will create a situation in which the denying of vital health services becomes part of the government cost plan? If it is OK to deny care, Would that not save money. Will you be able to obtain private insurance? Will you just be asked to die, even if your wallet is full? Will the insurance companies be here ten years from now or will you have to get both stamps and doctor appointments at the post office. Well, at least stamps. 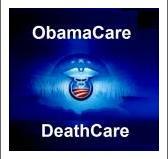 And, yes, no matter what lies you heard to the contrary, those death panels are most certainly in the bill. With government being forced to cut back in other areas, there may be an opportunity to redeploy government workers to help in Obamacare Administration. For example, perhaps a former building inspector can check you out (inspect) to determine whether you are structurally sound enough to have a critical operation. Perhaps after just one week of training, such loyal government employees can be spared having to lose their jobs. They can become a vital link in the Obamacare system. This would save your doctor plenty of time in doctor visits. Just have the building inspector double as a Physicians Assistant. Now, there would be some cost davings indeed. All hail Obamacare! Here is the scoop. The government will be paying all the bills. This will force doctors and hospitals to dance more and more to the government’s tune. Can you imagine the number of government ringmasters and impresarios who will be needed to fully claim our freedoms. They will be everywhere. Insurance companies will go out of business. Obamacare says that you pay about $695 for not carrying mandated care insurance. So, you do not really need a policy. So, now, let's say you get real sick. The bill says you can go get a policy even with your yesterday poor prognosis / pre-existing conditions. That is a formula for insurance companies or the federal government to go out of business. The former at least has risk. The latter has been out of business but it still owns the printing presses. Tell me why anybody should carry insurance at all? Just get it when you get sick. Then, when you are better drop coverage and pay the fine again. Think of the losses insurance companies will go through. We can finally get rid of all those nasty curs! This is a great plan devised by Moe, Larry, and Curly, Shemp, and Curly Joe. Within a few years after people catch on, insurance companies will no longer be an option. They will be gone. They make their money when nobody gets sick. If all their customers are terminally sick when they go to them, there will be only one provider left that can fill the bill. Gummy Gumment will step to the plate like the great mustachioed messiah saving the damsel on the tracks: "I'll pay the costs." Only the government will be left. I wonder if that is the plan and has been all along? Government control and healthcare redistribution will then be able to run unimpeded. Of course once your healthcare plan is redistributed to a more needy person, more than likely you won't see it again. The great irony is that in turning the good of healthcare into a right, your life and liberty are put in jeopardy. That which you worked for is gone but somebody who never worked is now in a position to outlive you. Instead of further removing healthcare from the market in which doctors and patients and other providers work together to help patients, we should return to that true free market in healthcare and get rid of Obamacare with all our might. It will kill us. In that market, everybody is empowered except government bureaucrats. In a real market, non-Obamacare system, the bad guys will not control your healthcare dollars. If it cost a lot, it is because it cost a lot. Get a job! Ron Paul is an American hero. He has a bill, HR 1495, called the Comprehensive Healthcare Reform Act. It provides tax credits and medical savings accounts designed to do just that. This is a start and a good start but like most good ideas with a completely partisan Congress with a full takeover in mind, there has been no action on the bill. Is Barack Obama a Doctor? What Ron Paul think of the Obamacare healthcare bill that was rammed through the Congress? "I think it's monstrous," Paul said. "I don't think it will improve medical care in this country. I think it's very, very costly and we don't have any money. And they don't have any way of paying for it." "On average, it's two or three times more expensive than they say. This is going to be incredibly expensive." Has the government ever lied about anything before? What happened to Health Care? Until recently it seems that the U.S. healthcare system had been the envy of the entire world. In terms of advanced solutions, the US is still the leader but the system in which healthcare is offered, providers, patients, government, and insurance companies has deteriorated. It is more than coincidence that there was far less government involvement in medicine during the time America held a major leadership in healthcare. "America always had the finest doctors and hospitals, patients enjoyed high-quality, affordable medical care, and thousands of private charities provided health services for the poor. Doctors focused on treating patients, without the red tape and threat of lawsuits that plague the profession today. Most Americans paid cash for basic services, and had insurance only for major illnesses and accidents. This meant both doctors and patients had an incentive to keep costs down, as the patient was directly responsible for payment, rather than an HMO or government program. The lesson is clear: when government and other third parties get involved, health care costs spiral. The answer is not a system of outright socialized medicine, but rather a system that encourages everyone – doctors, hospitals, patients, and drug companies – to keep costs down. As long as “somebody else” is paying the bill, the bill will be too high." Ron Paul's conclusion: "Socialized medicine won’t work; nor will managed care. The simple solution is for employers to give tax exempt funds to individuals to buy their own insurance. The same market based solution would be open to all." Hillarycare and Obamacare are socialized medicine. After Obamacare passed, Al Sharpton was quick to note that the people voted for Obama because they wanted a socialist government. They may have been hiding from using the S word or the P world (progressive) because of negative overtones but now, they feel they have been empowered by the victory of Obamacare. The Managed care system that we see in place in many places is a form of rationing that many see as the basis for Obamacare. Today, it seems to work for everybody else but the doctor and the patient. The gatekeeper (Medicare. Medicaid, or an insurance company) decide what you get and don't get. Who decided that? With Obamacare, the insurance company's will have just a short while to decide and then it will just be Uncle Sam. And Uncle Sam has no problem saying no to your health care. Cancer hospitals will ration care according to patient's age. The marketplace, not the government or insurance companies needs to determine the best healthcare. Managed care cannot work long term because for it to work, it promotes and rewards the corporations or the government (Medicare and Medicaid) for not providing care. You know who the players are who benefit. Their names are not popular anymore. It's the drug companies and the managed care facilities -- some still called HMOs. It's the AMA that lobbies US for this managed care, and of course the Benedict Arnold of all time, AARP somehow is a big player pretending to be the voice of the seniors in what's good and bad. AARP is part of the insurance industry that is competing against Medicare Advantage. How are they viewed as not having a horse in the race? Drug Companies, HMO's, AMA, AARP are the very reasons prices are so high. Only in medicine has technology raised prices rather than lowering prices. The more technology that is implemented, the more parties can share in the same service -- though there is still only one provider and one patient involved at a time. Managed care is the Obamacare Model with a shift. There will be lots more management and lots less care. The more things change, the more they don't always change for the better. "HMO", the original penultimate name in managed care, became a dirty name in the 1980's because they got so greedy they were killing people by denying coverage. Their goals for profit were so obvious, that they paid a big price. Marketing programs brought them back under a new name -- managed care. Now, various forms of managed care far more subtly manage costs in much the same way as HMO's once did. They just are not as stupid though their goals are similar. What is "global warming" today will be called "climate change" tomorrow. It is the same ruse. Only the name has changed. The idea is the same. HMOs once were thought to be best until greed set in and patients started to die or have their conditions worsen under this "care." It was clearly another name for rationed care. By the end of the 1980s and with a stack of unpaid and denied claims, people began to leave HMOs in droves, and the companies either went south financially or decided they were now managed care firms. The power of a name. The evil of HMOs that can also be prevalent in managed care without competition is that there becomes an innovative way to provide health services: incentives for doctors not to treat patients. The less a physician does for a patient, the more the company makes. HMOs and managed care plans make money by not providing a product. For those needing healthcare, that is not so good. Lyndon Larouche is a man to never mince words. His posture in the 2000 Presidential Election was to ban HMOs off the planet. `` The problem is the HMO law is evil, intrinsically evil! The only thing that will solve the problem is to cancel the HMO law; repeal it. End the existence of HMOs. Go back to the system we had earlier, a system under the Hill-Burton legislation, which is the postwar system, under which we improved health care. ``...The purpose from the beginning, in 1973 when that bill [the first HMO law] was passed, the purpose was to cut the health care of the population. That was its purpose, by privatizing it under shareholder value rules." In describing the curse of the HMOs and their rationing plan, Larouche invoked the memories of Hitler's Health Plan which on its own sounds like an oxymoron. Hitler called it the "Useless Eater" Policy. The essence was that certain people were not worth enough to society to keep alive. Hitler's idea was to eliminate the useless eaters by targeting a group of people and proclaiming that we've got too many of them. Hitler would reduce their health care. This was for real. Hitler's plan for the mentally ill, and other ill people in Germany's hospitals was to Cut 'em out! He looked for accelerated death rates as he believed that the country could not afford to pay for them so, "Cut their health care. Get rid of useless eaters"
It was this policy which led to the death camp system in Nazi Germany, especially during the war years. Lyndon Larouche sees a parallel to this system in the managed care / HMO system. He saw Congress and the courts backing the "Hitler-Like" system. His solution of course is and was " to clean out of the Congress every member of Congress who lines up in support of the HMO murder machine. Get 'em out!" In 2009 and 2010 Larouche sees what he calls the " HMO looting system" as exactly the "system" Obama is pledged to keep. Hill-Burton had been used to address the major shortages of hospital beds in underserved areas back in the post-war 1940's. Most of the beds created by the act were in the rural south. It was the first federal program that actually took needs, rather than ability to pay into consideration. Thus, it favored the poor southern states but it forced the government to assure there were enough hospital beds to take care of the sick. It was not based on hospital profits but by a desire to serve the people. To get the funding, hospitals had to agree to take care of a large number of poor people for free. Though a progressive idea, it really helped provide real healthcare (not free) to people that otherwise may not have ever gotten it. Today's progressive idea is that there is no real need to work with the care providers if you can take over the government and force everybody to play according to your rules. Obamacare is dangerous because for it to do its job, government must play fair and nice. Do you really think that is possible? Do We Need a Complete Overhaul of Healthcare? Complete overhauls of anything are risky and often do not perform as intended. Most Americans would agree that for the complete takeover and overhaul of anything from a baseball team to a soda bottling company to the healthcare industry, the federal government would never be part of the first group selected. Sorry, Charley!. The most inept choice would be government. Why would anybody think the government could take over 1/6 of the economy and do it successfully. While running for office, the President pledged to build on what we've got in healthcare. After election, he changed his mind. Did he really? instead he decided to eliminate what we have with 2700 pages of gibberish that even lawyers cannot read. And he gave everybody three days to read the 2700 pages. He chose the big-bang theory rather than a safe, incremental, evolutionary, one step at a time approach. Now, that this bill has passed, the weight of its own bureaucracy and the rage of the people will eventually kill it. But pain will occur in between. It will be repealed or America is going down. ObamaCare of course is bad for more reasons than HMOs are evil. Think of the individual mandate, the public option and Medicare buy-in for 55 to 64-year olds, and the $600 billion cut in Medicare benefits. All of these insidious measures are to advance the big government agenda, which the American people have already rejected, but Robert P. Casey Jr., Harry Reid, Nancy Pelosi, and Barack Obama, the new tag team have rammed it down our throats. And if you plan to clear your throats, the 16,000 new IRS agents will be assigned very shortly to insure that you choke on the first attempt. Obama means business. He just doesn't like business. So, what is the best and lowest cost healthcare solution? Over the long haul, the only way to tame health care costs in the U.S. is to wrest control of medical dollars from third-party insurers such as employers and government--and hand it to individuals. We discussed this briefly in this essay. Once individuals become the paying customers instead of the government and the employers owning the show, then YOU can shop around for your own coverage and strike a deal that is best for YOU. Of course, that is not part of the Obamaplan but then again, that may very well be repealed soon. How can a system in which you theoretically can buy all you want with price as no object work anywhere. It's like those five minute shopping sprees that you can win in which you load shopping cart after shopping cart and it is all covered by the shopkeeper. Except in this Obamacare game, you can stay in the store forever until some bureaucrat or IRS agent calls your name. You'll still have less when you leave. Some will tell you that extending health care tax breaks to everyone would be unaffordable and too costly for Uncle Sam. It would cost a lot less than a $trillion. Besides, our employers are getting those breaks right now. It is illogical therefore to think that tax breaks for healthcare premiums and for services would put us in an even bigger hole. That would be possible only if Obamacare were free and we know that the visible number is now charted at a trillion dollars minimum. Let's not forget that we will be paying the price for about four years before any of the benefits for all can be used. The huge numbers in the estimates of the price of ObamaCare are not looked upon so big because the public unfortunately is getting accustomed to the big deficit and debt numbers. Giving a few tax breaks to the public for health care costs would be far easier and substantially less expensive and something good for the people. -- So, don't expect it any time soon from this government. A recent Health Insurance industry study says Obamacare will add at least $4,000 for the family and $1500 per individual to your annual insurance costs. Blue Cross sees costs rising 50% with Obamacare. What does this mean? It means that $ Billions in new taxes on insurers, health care providers, device makers (pacemakers, defibrillators, etc.) will also need to be absorbed by patients in higher premiums. How is that a good idea? There is no free lunch. It will be the largest tax increase in American History and they told you it would be free. Yet, logic suggests that nothing that cost even the underestimated $940 billion of Obamacare is free. The $940 billion, is a big cost, and it is underestimated. You can;t give $940 Billion in services for free. On top of that to pay for Medicaid unfunded mandates, states would have to cough up another $33 billion at least and Medicaid is already bankrupting the states. Thankfully, states cannot print money so they will have to work that one out. The truth is that government is not a huge magician that can provide free or subsidized anything for someone without taking that money from someone else - and that someone else more than likely will be you. Welcome to socialism. Your checkbook will never rest until your account is empty. ObamaCare is prepared to add to an already bloated bureaucracy as you are about to pay for all the new hires who will be watching over you. Don't worry, the 16,000 new IRS agents will have to attend anger management classes before they are permitted to carry "heat." The federal gatekeepers standing in between you and your doctor and stealing your freedom will go to salesmanship schools to convince you that your deal is the best. They will also be trained using Rosetta Stone courses to master a second language that you do not understand and when they get angry with you they will be permitted to speak only in the other language. Don't plan on winning any of the debates. Even if you are young or very healthy and you think that you really do not need insurance, the government has already declared that you are wrong. That means that you do not get to make that decision. Uncle Sam knows better than you. The "individual mandate," which the state legislatures are boiling about and have sued the feds about is a federal requirement that says every citizen must have health insurance. The government is going to make you buy health insurance or the IRS will fine you or put you in jail. Welcome to the USSA. Don't resist! Remember it took a lot of years for the FBI to carry HEAT. Watch the bulge in the breast pocket or on the back when the IRS guys come collecting! Under threat of a stiff penalty, every American will be forced to obtain something the government deems necessary for you to continue your legitimate citizenship. It is called an insurance policy. It was once an innocuous notion. Now, it is needed even more than a passport. Ironically, If you are an illegal alien, you still won't have to pay for your healthcare. And, by the way, you don't even need a passport. This "individual mandate" is a gross abuse of governmental power but it is just the beginning of the end for individual liberty. The bloated bureaucracy will find other ways to penalize citizens, such as limiting mammograms to only those over 50 and other cost cutting measures that will cause a number of US to die before our time. Perhaps the mammogram limitation can be raised to 80 years old and that would save even more dollars for society. Please note I say that merely to make a point. But, the key point here is that this is a violation of every American's right to decide what is best for himself or herself as well as his or her family. The good news for the government is that when somebody dies, they (the government) will no longer have to use "its" funds to take care of them and there are those Obama czars who suggest that in these instances, society gains. The big bottom line is that this big Obama power grab known as Obamacare is not about to save us money, as a nation or individually. Nobody can spend a trillion dollars and have more when they are done. This bill will increase your insurance premiums, raise your taxes in a big way, decrease your wages, steal your jobs, blow-up the deficit, reduce your standard of living, erode your privacy and all but eliminate your personal liberty. How is this a good deal?